This simple folding commode can also function as a toilet surround. The seat clips on and off and can be easily cleaned, it’s height adjustable to provide the best support and assistance to users of different heights and those with particular disabilities. The lightweight but sturdy aluminium frame folds away for storage or transport. As a toilet surround, it provides a little more help to those whom might find sitting down on or standing up from a regular toilet difficult. The sides of the surround function as grab rails, making movement easier and reducing the chance of a fall. 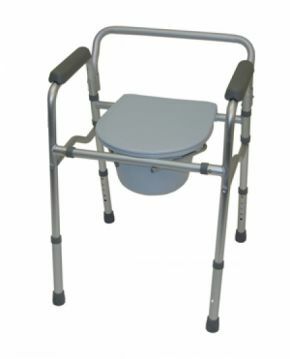 It can be an excellent and cost-effective solution for those who don't need a full commode, but could use some extra support to maintain their independence. Ideal commode for occasional use when elderly Mother visits.